It is important to get a founder-friendly and proper 409A valuation, which is a problem many business owners face. Have you had your business valuation done or are you somewhere in between just finding out that you need to do it and what does a 409A valuation have to do with you? A business valuation is the process to find the economic value of a company. For a more straightforward explanation, the business valuation is used for finding out the fair market value of a business, which is the price at which the company would be sold (if decided as so). The purpose for valuation includes getting the sale value, employee compensation packages, and for establishing partner ownership. It is important to get a founder-friendly and proper 409A valuation, which is a problem many business owners face. But what does the 409A valuation have to do with all this? Continue reading to know more about the 409A valuation and the steps to get one done. The very first thing that you need to understand is that the 409A regulation and valuations are two different things. To understand this, it is important to comprehend the difference between 409A and the business valuation as seen by investors during funding period. Before we can talk about the 409A valuation, let us understand what a business valuation is. Business valuation is the process where a set of methods are used to get the value of the interest of the owner in their business. This process can be performed by the owner themselves or someone from inside the company like the accountant or financier. On the other hand, the 409A valuation is utilized to find the fair market value (FMV) of the business. This value is usually set by a third party valuation service and not by the owner nor the company. Regulated by the IRS, 409A sets the strike price for the common shares that are usually awarded to the advisors, employees, and others, and makes sure that these options represent the actual value of the company. The IRS needs the 409A valuation for the businesses so that these companies can easily maintain their safe harbor status. This valuation is normally, but not always, different from the business valuation that is done for the company during the fundraising period or when the owner wants to know the value of the company. And the main reasons for this is that the investors usually receive the preferred stock of the business. The preferred stock is normally valued at a much higher price as compared to the common stock due to the much better liquidation preferences. In addition to this, third-party independent valuation providers help the company to establish the safe harbor status. This in turn, prevents the onerous IRS penalties that can be placed on the shareholders of the company in case the FMV of the company was not determined appropriately. As mentioned above, 409A is not the same as a simple valuation, and it is normally done when the company is about to offer the stock options as an equity compensation to their employees or offer stock options to the contractors or investors. The 409A is a section that comes under the US tax law. It holds the rules regarding the stock options that some companies give to their employees. Stock options are an optional right provided to either the employees or investors to purchase the stock of the company in the future at a fixed price per share. This fixed price is called the exercise price of the strike price. Many companies use the stock options by giving them as an award to the employees as they lock the price of the stock of the company. And in case the value of the stock of the company increases, the employees would be able to purchase them at a lower strike price. For instance, the stock option could give the employee the rights to purchase about 2,000 shares of the company for a fixed price of $3 per share. The time period to purchase them is up to four years after the grant date. In case the employee makes a decision to exercise the option on a date in the future, when the cost of the share is $6 per share, they would just pay $6,000 for purchasing the stock which would be worth $12,000. As this would be profit to the employees, they would usually need to pay tax on the $6,000 profit regardless if they decide to sell or keep the shares. Normally, the options become available in installments, which means part of the shares may become available for vesting after one year of being granted to the employee. The rest of the shares can be available to vest after two years to be granted to the employee. Get Your 409a Valuation & ReportsSTART THE PROCESS! What is the purpose of a 409a valuation, and why is it important? Getting a 409A valuation allows your business to follow all the tax laws and avoid any of the IRS audit sessions that can cause legal troubles, tax issues and even interfere in the company’s functions if problems arise. Moreover, the need to hire consultants or lawyers for defending your company while the case drags would cost you a lot more. More importantly in these situations, the employees in your company would suffer the most due to the immediate tax issues for them, which is not good for a company putting their employees at risk. It is important to remember that you gave the stock options to your employees to reward them, and not to leave them with a huge penalty with the IRS. As mentioned above, the 409A valuation would protect your employees from any tax issues that might arise in the future with the IRS. It also protects you and your company from any huge bills for lawsuits or tax liabilities. Let us imagine that your business didn’t get the 409A valuation, and you end up granting the stock options to the employees that would permit them to get the 2,000 shares at $3 per share. Instantly clear the income tax payments on the difference between the incorrect strike price ($3) and the current value ($10), which is $7 per share for the 2,000 shares. This means that the total amount is $14,000, regardless if the employee has exercised the option or not. And if that employee comes under the tax bracket of 33% of income tax rate, this means that they would have to pay a $4,620 income tax bill. Pay the penalty that would be equal to the 20% of the price difference. As per the example we have 20% of $14,000. This means that the employee would owe them with another $2,800 penalty to the IRS. Additionally, the IRS would also add interest and raise the total bill of $7,420 to something more higher. But if the company got the 409A valuation done on time, and used the real value of the shares at that time ($5 per share), the employee would be able to delay the payment of the tax until they exercise the option and purchases the stock. The delay could be many years after the audit is performed by the IRS. As per the example, the employee purchases the shares when it has a worth of $10. The tax owed by the employee would be based on $7 per year. And with the tax bracket of 33%, the total tax bill would be just $4,620 for $14,000. What factors influence your 409A valuation? What method for valuation should you use? This is obviously the most important question and the very first questions that you would have to ask, keeping the industry that your company is a part of, the services it offers, the tangible and intangible assets, the profit that the company makes, etc., in mind. The valuator would be able to explain this better to you as per your situation and company type. You might need to use more than one method for getting the value. How would you support your concluded marketability discount? The IRS would look at the evidence of the considered factors that the appraiser used, and that are specific for your company. They would also need the data that was used like the restricted stock studies, and not just the quantitative models. Hence, you would need to save all these things when having the 409A valuation done. Can the valuation be utilized for both the financial reporting and tax purposes? You do not have two different values of a business and you need to make sure that the 409A valuation done is right, so that you can use it for any area in which the value is needed. When to get a 409A valuation? You decide to offer stock options to your employees. It has been a year since you had a 409A valuation done. Your company is raising or has raised new funding. People begin to purchase and sell the shares of your company, which does not include the shares that you had issued originally from the corporation. In any of the cases, you know that you need a 409A valuation done so that you can easily bypass any possible penalties for valuation by the IRS. What is a safe harbor for your company? The meaning of safe harbor for your company means that you have had the 409A valuation completed in the last 12 months for your company at an acceptable price, which is protected from proving that the FMV is accurate to the IRS. This means that any burden of proof for your valuation would be on the IRS if they choose to audit your company. This is important as it means they would essentially have to disprove your valuation with facts, figures and documents. The 409A valuation is 99% of the time performed by a third-party, which is always considered to be the best way. There are a few cases where if you are an illiquid company that is under 10 years old, you can get the safe harbor status from an internal employee who has the right accounting experience and does the 409A valuations accurately. If you are do not have the safe harbor, and the IRS comes to audit you to find out that you have issued options improperly at an incorrect price, your employees would be taxed immediately on this and have to foot an extra 20% fine on the difference in value plus any additional penalties. In short, this is a significant financial burden to your employees, who should be protected by a more responsible and knowledgeable company founder. In order to avoid these problems, most companies choose to play safe, and appoint a third party valuer to conduct their 409A Valuation. How to get a 409a valuation? Option 1: Do the 409A valuation yourself. Even after reading the initial parts of this article, and you still have the question in your mind, “What if I do the valuation myself?” then read this to get your answer. Let us assume that you are not a professional appraiser, because if you were, you wouldn’t have been reading all about the 409A valuation. And well, there are no specific requirements for certification to become a professional 409A valuer. Nonetheless, as per the IRS, it is important that you have enough significant and relevant knowledge, training, education, and experience to be able to perform a 409A valuation on your own. And if you have the skills needed and match the IRS requirements, then you have the option to do it yourself and avoid any possible penalties for valuation by the IRS. One of the benefits of DIY, if you have the right skills for it, are that you would be able to save a lot of money as well as time. Moreover, by doing it yourself, you would have a higher control on the valuation of the common stock of your company. But in case there are any mistakes, you may end up losing more in the end. On the other hand, doing it yourself would not give you the entitlement to the safe harbor protection. And in case your company is audited, the burden of proof would be entirely on you. Due to this, this option is not considered as the best one. Option 2: Use a software tool. This might have come up, where you felt that it is better to pay for a software or use a free one that would do your 409A valuation. And this would mean that you didn’t have to pay extra for having a third-party to come and do it. Well, yes, you can use it as there are many online. Get Your 409a Valuation & Reports! With your cap table recorded with Eqvista, your valuation will be seamless. 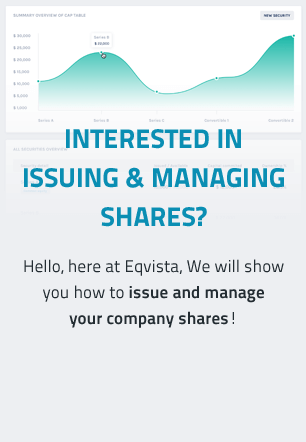 Start with Eqvista App, it is free! The benefits to use a software is that you would not have to spend much time to get the report. Other than that, it would help you save a lot of money which you would have spent on a professional valuator instead. And in the early stages, this would help you a lot. On the other hand, the drawbacks are that you would not get the safe harbor protection, and if you are audited, the burden of proof is on you. Moreover, not everyone can use the softwares. You would need to meet the criteria to be able to use it properly. Hence, this option is not the best one. Option 3: Hire a firm. At the end of the day, the best and most reliable option is to hire a professional valuator or a firm that can offer you the 409A valuation along with the safe harbor protection. And with this, you would not have the burden of proof when the IRS comes to audit your business. But for this, you would need to look for a firm that is both knowledgeable and experienced with the 409A valuation. It should be able to offer you the right value where you would be able to avoid any possible penalties for valuation by the IRS. Normally, it is advised to get the very first valuation before you issue the first common stock options, even for the very first hire or advisor. It is important to get another 409A valuation done when you have raised a round of venture financing or any sort of funding. This is because the previous 409A valuation becomes obsolete as soon as you get more funding. As soon as your business becomes mature, where it has many employees and has crossed the Series A funding round, you would need to have a new 409A valuation done within every 12 months, or even earlier (when more material comes in the company or so) if necessary. This is so that you can maintain the safe harbour status. Other than these points, below are some extras to know about and keep in mind. How Long Does the 409A Valuation Process Take? This is the very first step, where you need to give your data over to the valuer. This can be done in 1 day or 1 month, depending on your timeframe and any deadlines you may have. This step is the main reason why many companies have their 409A valuation delayed. It’s better that you have all the files with you and organized in one place. But in case you don’t, you can check about it with your accountant or your lawyer, as they may have some on file. You can also have your version of your cap table synced with theirs, so you get the right information in the end. This is also one reason why it is advised to keep your cap table up to date and to give your lawyer and accountant a heads up to keep the details as well. So, if you want the 409A valuation, you would need to prepare the data first. Past 409A reports, if any. Full set of financial statements. Copies of rev share agreements, partnering agreements, joint ventures, etc. Any liabilities or assets that are not noted on the balance sheet like product warranties, compliance requirements, pending lawsuits, etc. Copies of agreements or documents dealing with shareholder rights. Financial projections of at least 1 year, but it would be much better if it was for 5 years. After the data has been shared, the firm then runs the report, which can take about 10 to 20 days. This depends entirely on the firm you hired for the 409A valuation, but the overall process normally takes less than 3 weeks. There are firms that can give you a rushed report for a premium, which can come in about 3 days. But the cost for such services ranges from usually $1,000 to $3,000, and more if you need it sooner. Since there is a growing trend today of cap table services and management along with other compliance reports, you can expect to spend much less than using a separate firm for only valuation services. But again, you need to choose the option that would provide you with the safe harbor protection. The first draft gets to you when the 409A valuation is done. Now, it depends on how long you take to analyze it and digest it. In case you have any doubts about the draft, you would have to send it back for a revision. It is very common for people to have a revision at least once or twice after the draft has been prepared. This is mostly to get a lower strike price (explained below). Just to refresh your memory, a strike price is the price at which a stock option can be exercised. In the end, you get the final report delivered to you, anywhere from 1 to 10 days after the revisions. Now that you are clear about the 409A valuation, let us understand how the valuation is performed. Out of the many methods available, there are three main strategies that are used the most. The Asset Approach, Income Approach, and the Market Approach are one of the most common ways through which the valuation of the company is done. This method is used when the business has just raised equity funding. As the investors assumedly paid a FMV for the equity, this would be used to get an estimate of the common FMV for the company. The other market-based approaches utilize financial multiple information which includes revenue, net income, EBITDA, etc., from publicly traded companies that are from the same industry and situation. These are then used to compare with for estimating the company’s equity value. This is an approach that is very straightforward and it is used for the companies that have a positive cash flow and sufficient revenue. This is the least common and supported 409A valuation approach, and is mostly for the very early stage businesses that have not raised any funding and do not have any revenue yet. Hence, this method is used to just calculate the net asset value to figure out the right value for the business. With all the explanation above, you might know now that you would need a low strike price for your 409A valuation. But why? Well, the lower your strike price is, the lower your employees can use to exercise the stock options. Moreover, this also means that the company gets higher realization of value when it becomes successful. Other than this, if the strike price is high, the option holder would get more when they sell the underlying stock. Nonetheless, there are founders who feel that a lower strike price would make their business look bad for the investors, which is not always the case. Investors are aware that the 409A valuations are used to set the common stock prices, which is why they usually do not use the 409A to evaluate your company before they agree to fund it. No safe harbor protection and you would have to show proof to the IRS during the audit to prove the strike price decided by you. Hence, you would not be able to answer any audit questions to prove that the value you have set is right. In case the actual strike price turns out to be higher than what you had set, you as well as your employees who exercised their stock options would be penalized. The valuator does not have proper credentials and experience to evaluate the company, which is why the strike price is low. You may be blacklisted by the audit firms and this news would spread to other firms in the area. Due to the low valuation, you would be challenged about the past valuations even if a certified valuator had performed it. Investors might not hear your plea for raising any funds for the business. You might also lose your credibility as a brand and new talents would not come into your company, if the word goes out. Hence, it is better to settle for a higher strike price when you are in doubt about something, especially if you are doing the 409A valuation yourself (though you should have a professional valuator do it). Create Your Cap Table Now – Easy & FastGET STARTED, IT’S FREE! Yes, there is a penalty for you too from the IRS. Well, there are a few possible penalties for valuation by the IRS that you might have to pay for in case you underestimate the FMV of your business and get a low strike price. The employees or anyone else who has the stock options would be instantly taxed with the regular income tax the moment they vest their options. In case your employees are not able to pay the income taxes, the IRS would add in more penalties over it. State penalties and taxes, depending on the state. The IRS tax underpayment penalty along with an additional 1% penalty. In short, the possible penalties for an incorrect valuation can be costly to get your company back in place (hiring a lawyer to defend your company and to help your employees). But that is not all. In case you overestimate the FMV where the strike price is made high instead, your employees would get a much lesser income that they could have got. And this is obviously not going to thrill your employees. All in all, the overall point of the 409A valuation is to have your company protected from an audit. Other than that, it helps you in protecting your employees from any possible penalties for valuation that are inaccurate. And it is normal for the early stage startup companies that have a very low strike price to not get audited by the IRS. But since the 409A valuation is not that costly, why risk it at all? Having it done on time would help you in the long run. To know more in details about increasing your company valuation or the methods used, check out the previous articles here!